Is there ever such thing as too much chocolate? Is it overkill to make a dense chocolate cake with rich chocolate frosting, creamy chocolate filling, and sweet chocolate covered crunchies on the outside? Personally, I don’t think so. I have had a chocolate obsession since the womb. Every birthday for the first eighteen years of my life, I made myself a double chocolate cake with a variety of toppings. I have been known to devour truffles, inhale fudge, and eat molten ganache straight up. Nothing to me–and I mean nothing–can achieve that dreaded rumored level of “too much chocolate” that my mother is always going on about. However, I do concede that, were such a horrible myth indeed a truth, that these two cakes might just be examples of chocolate overload–proceed with caution! 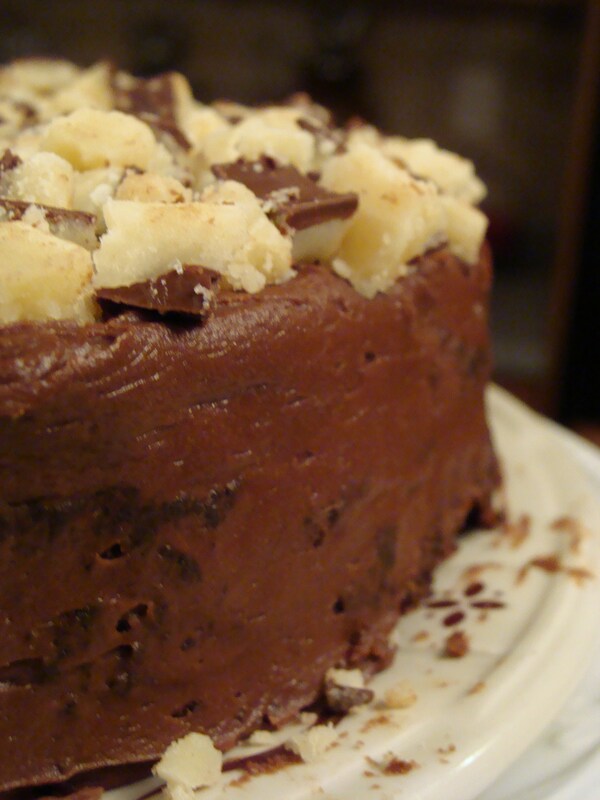 This heavenly creature is, essentially, Ferraro Rocher candy in cake form. 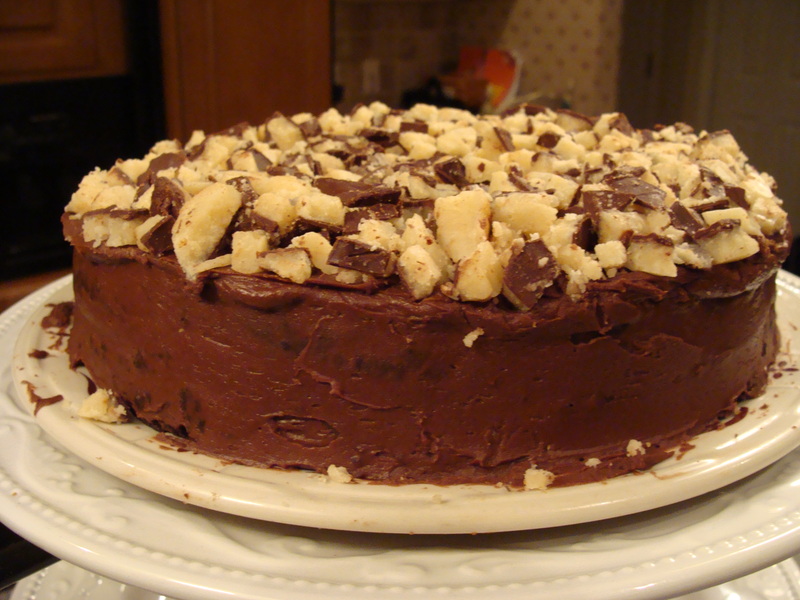 I made the Chocolate Hazelnut Truffle Cake for my Dad, a fellow chocolate junkie, for his birthday last month. 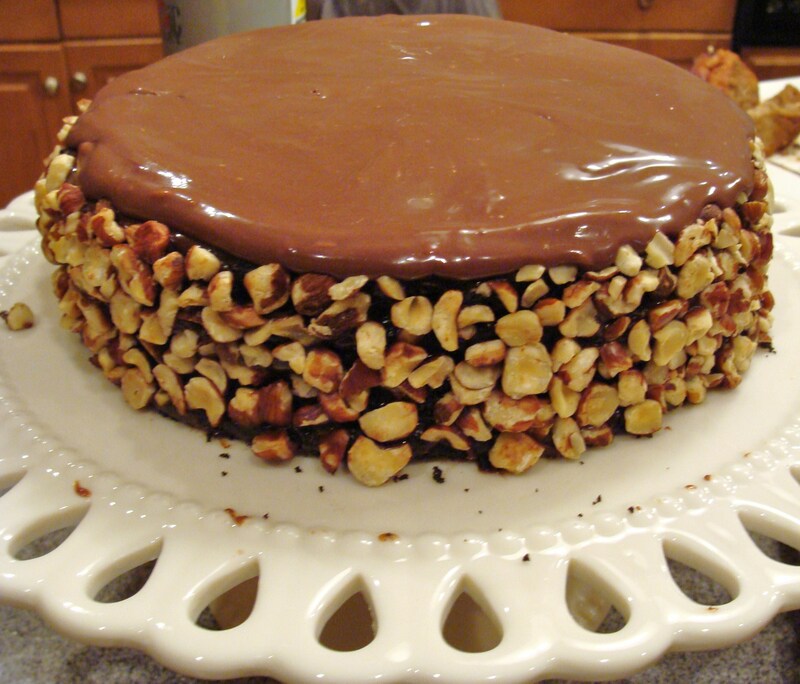 To make this cake, first bake two layers of your favorite chocolate cake and let them cool. If you want a really elegant cake, you can go ahead and torte them (a fancy word for cutting the layers in half horizontally). For this cake, I used the recipe on the back of the Hershey’s cocoa powder–but I used the dark cocoa powder so it was nearly excessively chocolatey, which is just the way I like it and, from a practical standpoint, contrasts a little better with the frosting. I filled the cake with a jar of Nutella, but I’d recommend using two next time, or at least getting the larger jar, because it only made thin layers. I then covered the cake in a milk chocolate ganache (see here for more info on ganache-making–it’s easier than it looks! ), reserving the extra for last-minute touch-ups, and packed chopped hazelnuts around the sides. I would highly recommend toasting the hazelnuts, which I didn’t do, and then grinding them in your food processor to a slightly finer texture, though if you don’t have the equipment for such an endeavor or don’t have the time, raw and coarse are fine too. This cake was, as are many good cakes, simply a “just because” cake. My boyfriend and I had a chicken parmigiana dinner a few weeks ago, something I promised after we salavated over the fancy chicken parm offerings on the finale of MasterChef earlier in the week. I wanted to make something nice for dessert, and I knew that if anyone could appreciate this chocolate monstrosity with me, it would be Steve. Yum, that second cake looks luscious. I appreciate the nut-free option. Also, you and Steve are cute.